Judd Winick writes a fascinating Green Arrow, a hero who is truly his own worst enemy. In Winick's first two Green Arrow trades, Straight Shooter and City Walls, Ollie can battle mutated ogres and lead an army in revolt against a hostile takeover, but he can't get it together enough to take responsibility for his family or stay faithful to the woman he loves. And in some ways, the emotionally-stunted Green Arrow is more interesting to watch than the emotionally-stunted Batman; while Batman remains aloof and emotionless, occasionally barking orders at his partners, Green Arrow is all emotion (as either Winick or Brad Meltzer themselves wrote), never hiding his affection for those around him, making it all the more tragic when he barrels right through to betraying them. That said, it is somewhat disconcerting to go from Meltzer's Archer's Quest to Winick's Straight Shooter and City Walls (the missing Ben Raab Green Lantern crossover issues not withstanding), in that Meltzer portrays Ollie as just back from the dead, not quite in touch with his surroundings, and showing the inklings of turning over a new leaf to go with his new life, whereas Winick's Ollie seems very in touch (at the beginning of Straight Shooter, he's talking about crooks getting "beat like a boy band at a Metallica concert"), and blunders head-first into trouble with Black Lightning's niece. It's interesting, sure, but much of that has been done before. One of the good things, if I may, about the death of the Silver Age's big three -- Green Arrow, Green Lantern, and Flash -- is that it paved the way for Modern Age characters with more relevant stories. Wally West, of course, is the big success story, and Kyle Rayner had his time in the sun (less time, frankly, than I think he deserved, but we can look at that more when Green Lantern: Rebirth comes around), but for whatever reason, Connor Hawke just didn't take. And that's fine. But if DC's going to justify to me bringing back Oliver Queen to headline Green Arrow, I don't want to still be reading the adventures of the Green Arrow from the 1970s. I want to see a Green Arrow that's conscious of being an anachronism, with stories that play off of that. Meltzer did this beautifully for a time. Winick, as I've said, writes a fascinating Green Arrow, but the characterization doesn't completely jibe with me with what Kevin Smith and Meltzer set up before. While good, City Walls suffers from a marked similarity to plot-events in Batman: War Games and character-events in Catwoman (it came before War Games, actually, though after Catwoman, but the City Walls trade follows both). Without giving away the last page, City Walls seems set up to bring the characters to a certain point, and while it accomplishes that, the demons-take-over-the-city-and-we-need-an-army bit didn't stand out as remarkable to me (not bad, just unremarkable). What I did like, and would perhaps have liked to see more of, were the little bits that played Ollie's trademark antipathy for fascism against the demons cracking down on crime in the city—this plays an established character theme in a new way, and that might've been the spark I was looking for. One area where I do think Winick excels is in his writing of Ollie and Dinah's relationship. With seemingly very little difficulty, Winick makes absolutely clear how well these characters know one another. In Straight Shooter, Dinah understands full well that Oliver saying he's fine doesn't truly mean he's fine ("I need you to tell me not to come back [to help,]" she says. "I need to hear the words.") In City Walls, it's nearly palpable that Dinah suspects Oliver's infidelities, and not only gives him the chance to come clean, but lets him know she's doing it ("Is there anything else you want to tell me?" she says. "I'm asking. I won't ask again."). It's good, good stuff, done swiftly and well. So certainly I'm game for Green Arrow: New Blood (my guess at the next Green Arrow trade, hopefully this year), where I think plots with both Dinah and Mia will come to the forefront. And, since I've been reading Judd Winick here, I'm actually now to start Pedro and Me to read some of his other works. 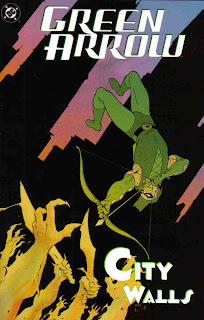 Did you read Green Arrow: City Walls? What did you think?